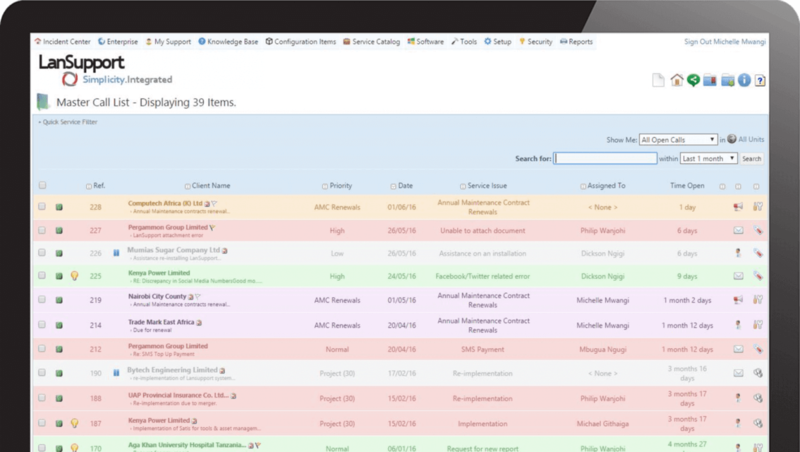 Track all incidents and requests, in their entire life cycle, from a single dashboard. Nothing falls through the cracks. Multi Channel Support. 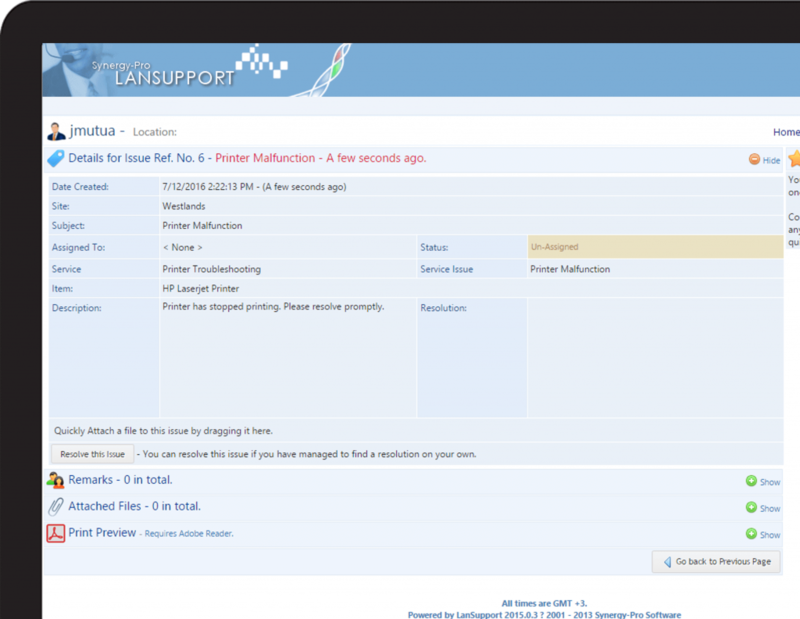 Lansupport allows creation of tickets via the web service portal, automatic creation via mail, social media (Facebook and Twitter) as well as help-desk creation of tickets from phone calls. Auto-assign tickets based on individuals or a team, or by expertise. Predefined SLA's. Ensure timely resolution of tickets based on pre-defined SLAs. Multi-Level Escalation based on individuals or a team, or by expertise. LanSupport supports a multi-level escalation matrix in case of violated Service Level Agreements. Help-desk notifications. 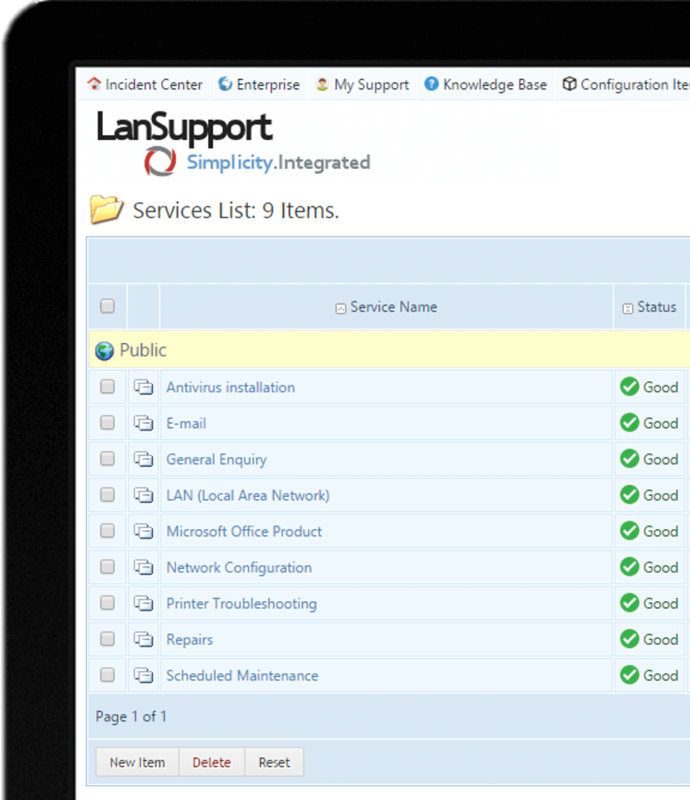 Lansupport provides for notifications based on ITIL processes as well as customizable ones. 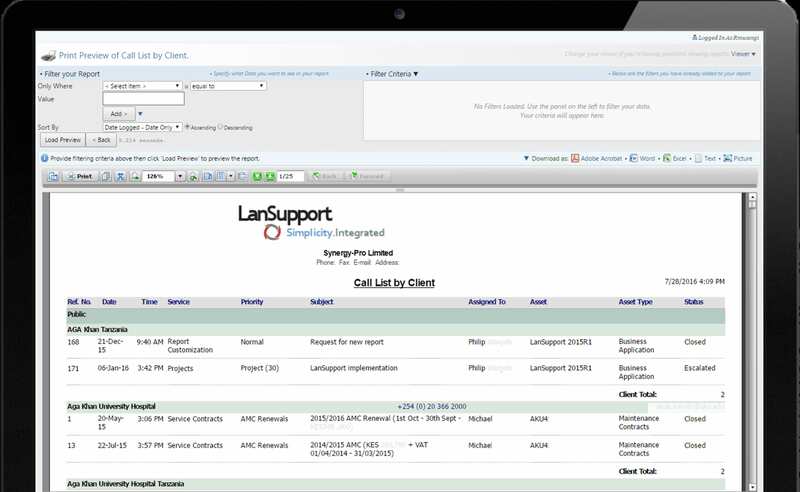 Lansupport's Self Service Portal enables a client to log-in and report issues by themselves via the web based service portal. Client-side troubleshooting. Clients can log in and, troubleshoot and resolve issues themselves before creating a ticket through the checklist feature. Help-desk Notifications. Enhance interaction with your customers. Client Remarks. 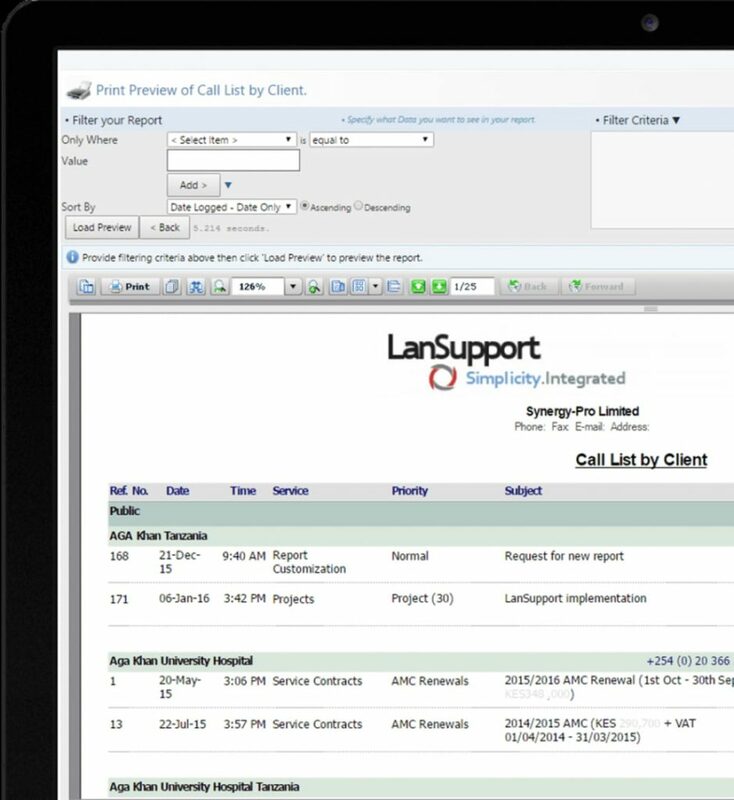 LanSupport's remarks feature fosters communication with clients and provides quick updates when reporting a change in client's status. Knowledge Base. Provide helpful articles and materials through the Knowledge-based service. Services and Service Issues. Streamline service management by having a well-defined list of services offered by each department. Service Groups. Utilize service groups to differentiate the type of services you provide. Client Service Levels. Group your clients to relevant service levels and specify priorities for each. Enable engineers to prioritize client support and maintain excellent customer service. Incident Priorities. 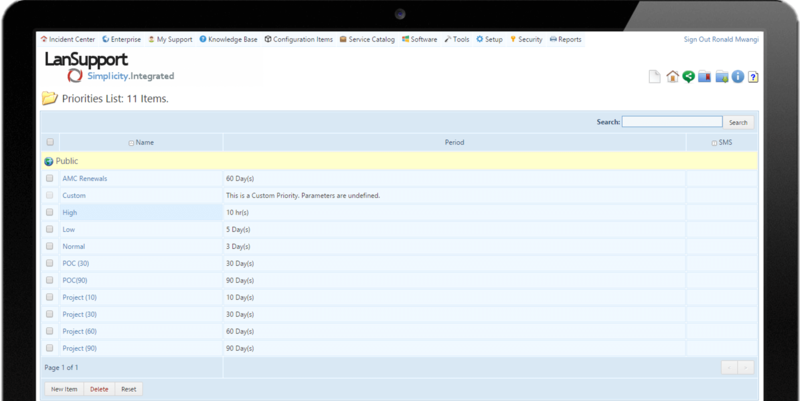 Set up custom incident priorities to suit your specific needs. Determine appropriate response times for each urgency level and ensure incidents are accorded appropriate attention. 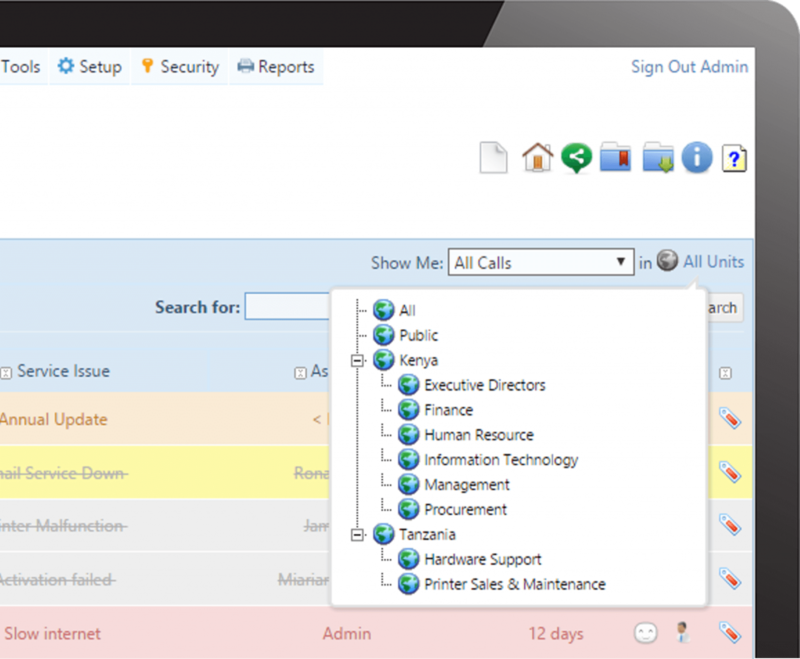 Automate your helpdesk processes using intuitive and easy-to-use features. Schedule tickets for regular activities such as maintenance and backups. Define your organizational workflows into processes. Keep track of the progress of each process through tasks. 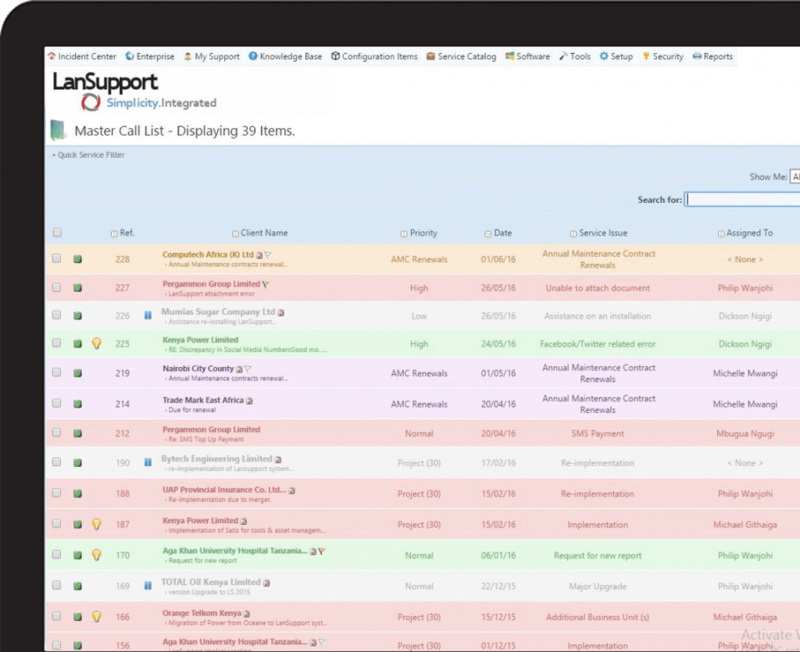 Schedule reports to help regularly keeping track of helpdesk operations. Separate and manage different operations from a single software through the multi-tenancy feature. 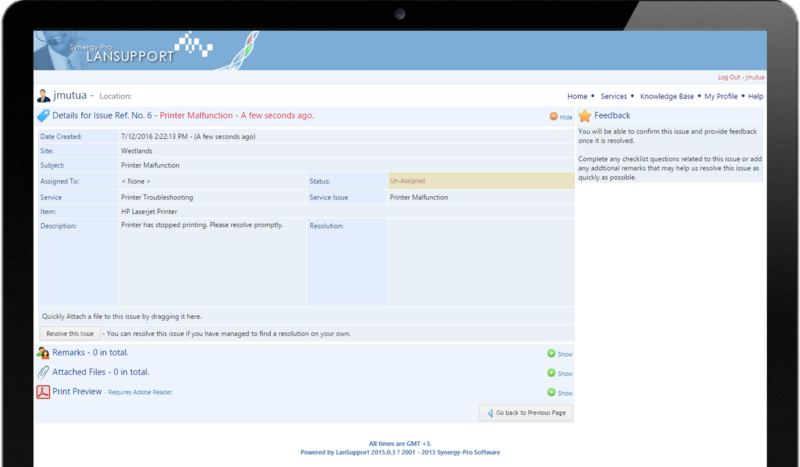 Customize helpdesk operations with custom ticket workflows for various business functions. 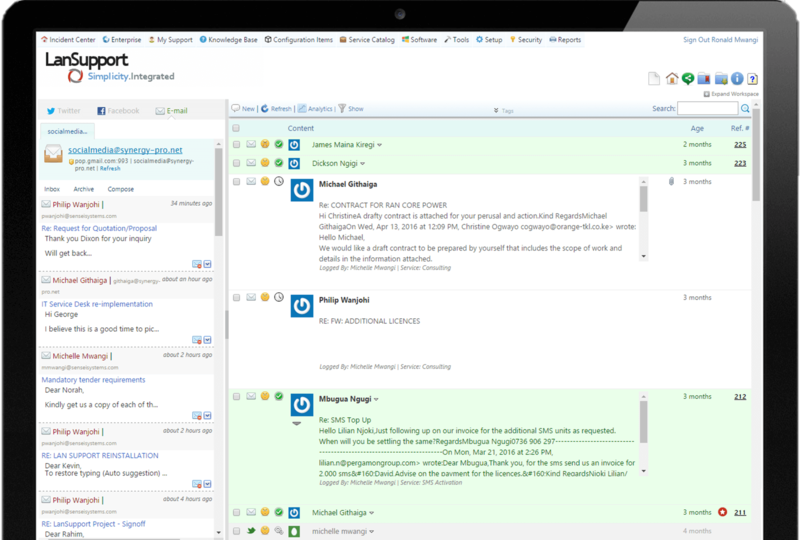 Track tickets and processes from your various business functions all on one software. 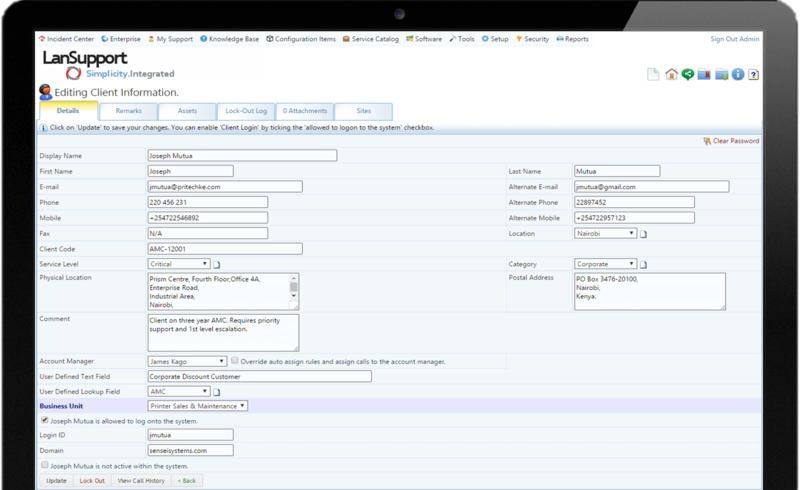 Configure the separate business functions with their separate catalog and configurations. 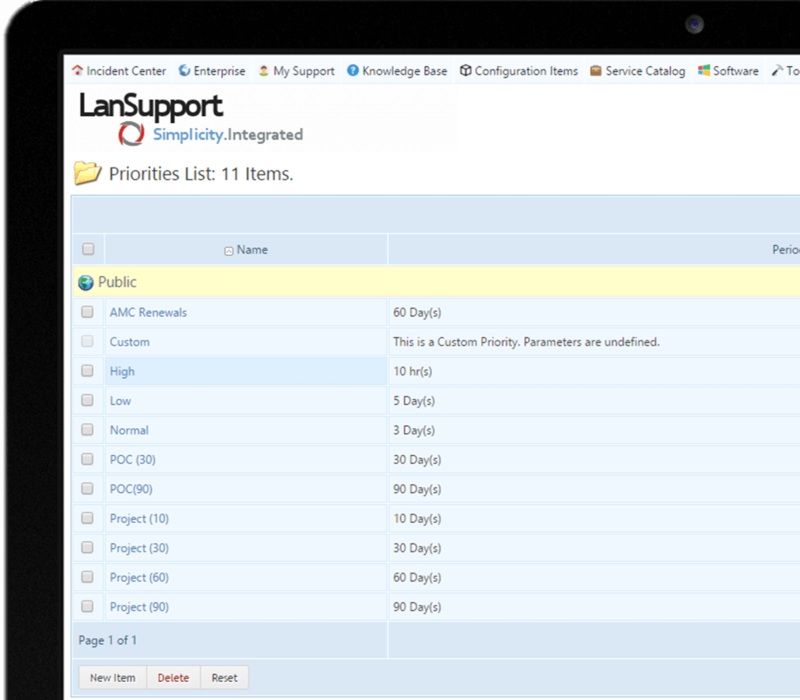 Gain insight of operations from the vast library of reports available in LanSupport. Customized reports. Need a customized report? LanSupport can modify or create a report to suit your specific needs. We are soon introducing a new report builder feature for this. Automatically create processses and their respective tasks based on a clearly defined service catalog. Auto-scheduling of reports can be easily customized to update the necessary personnel regularly. Set up daily, weekly, monthly or whichever duration you may choose. Export reports in your favorite document format. Lansupport supports pdf, word,excel and other formats. Improve customer service. Support your customers at their convenience. Supports automatic creation of tickets via email & phone calls.Auto create calls via social media platforms i.e. Facebook & Twitter. Auto create calls via social media platforms i.e. Facebook & Twitter. Optimize the follow up process through auto generated reference numbers for each ticket. Respond promptly to social media posts right from inside LanSupport. Realize service gaps and business opportunities by tracking customer interests and queries. 8. Client and Account Management. Manage all your client data and information on one dashboard. 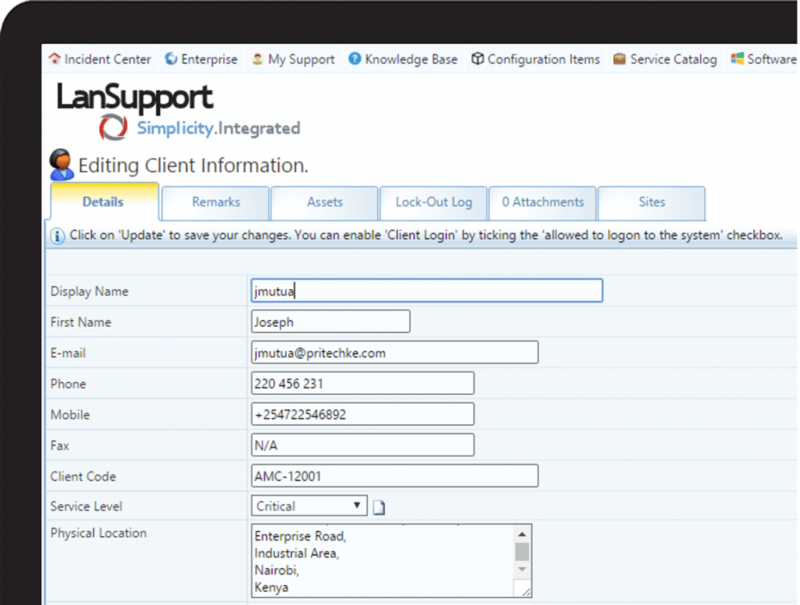 Capture client details and other relevant information in a simple, easy-to-use portal. Contact information, assets, priority levels and so much more. Client Remarks. Use client remarks to improve communication with clients though updates. Client Assets. Take stock of and keep track of all assets attached to your clients and keep a record. Allow attachment to improve record keeping.Supports creation of client sites to categorize clients with branches. 9. Service Level Agreement Management. Manage client expectations while tracking employee performance. Manage customer expectations by implementing SLAs & OLAs within your organization. Prioritize individual incident types to ensure timely service delivery. Use custom notifications and alerts via Mail or SMS to help you keep track of SLAs. Track employee performance using customized KPIs.